My first real experience with Aimpoint’s Comp M2 (or M68 in Army circles) came on my first trip to Afghanistan in 2003. I had trained with the optic stateside while I was in the 82nd Airborne Division and again once I was assigned to 3rd Special Forces Group. In 2003, while on deployment with 3rd Group, I learned how much I revered it after using it for several months on a wide variety of combat missions. I had more than one optic from which to choose and rotated through them, but I loved the M68. Initially, I thought I would want some magnification for the wide-open spaces of Afghanistan, but soon learned that the M68’s no-specific eye relief and its field of view that mimics the human eye were much more valuable. If I could narrow down a single, initial experience that sold me on the red dot sight – a light-bulb moment if you will – it would have to be while I was using a low-powered magnified optic in the spring of 2003. This was early in my deployment and we were doing a lot of mounted patrolling in rural areas. As our truck crested a hill, there were two Taliban soldiers about 100 yards in front of us. One did a spectacular mag dump from the hip with his AK-47. He looked like he stepped right out of a Rambo movie and he didn’t hit a thing. Post-mag dump, both took off running. Three of us jumped out of our trucks and took off after them; my two teammates followed the one on the left and I chased the one on the right. It didn’t take long for my opponent to open his lead to 150 yards or so. What I soon discovered with the magnified optic was that I had to hunt for my enemy through the scope because of the narrow field of view. I was moving and he was moving, and it was tough to keep my sights on him, even at that modest distance. I was able to take a shot but I had to work for it. This experience left me questioning how much magnification, if any, is really required in a combat sight. Fast forward a year later to the same area and I was in another foot race with yet another Taliban soldier. I saw him as I exited a cornfield and he was about 200 yards away. I had no problems getting my M68’s red dot on target and putting accurate shots on him, even at a couple hundred yards away. From that point forward, I always kept an Aimpoint M68 on my rifle. 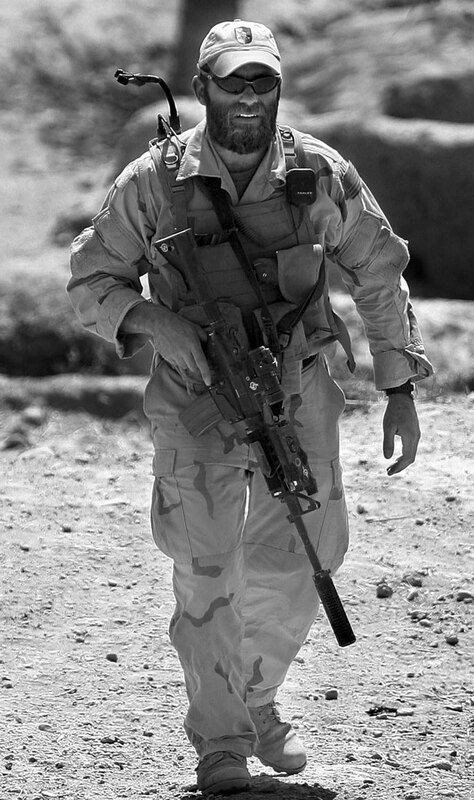 Captain Beckstrand conducting a patrol in Afghanistan in 2004, complete with his SOPMOD M4A1, equipped with an Aimpoint COMP M2 red dot sight. These experiences are very similar to those of countless other veterans returning home from our wars overseas. Like me, many probably had preconceived notions about what optic was good for a particular environment and then that opinion changed through experience. For any rifle used at ranges closer than 200 yards, a red dot optic is ideal. 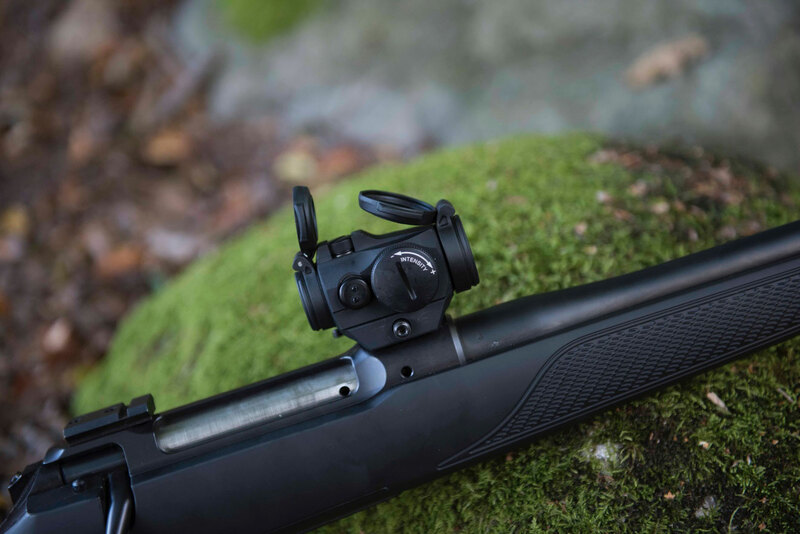 The ability to use both eyes normally to identify the target without having to transition to a shorter magnified field of view means there is no hunting through the scope and no lost targets. The shooter never has to take his eyes off his target with a red dot sight. The argument against red dot sights is the lack of magnification. This is a legitimate gripe when the range to the target exceeds a couple hundred yards or when the target measures 3 minutes of angle (MOA) or smaller. At ranges beyond 200 yards, it becomes much harder to see and identify the target. However, the vast majority of shots taken in a combat zone or a hunting field occur inside that distance. I am a firm believer of setting up a rifle for the most likely situation you’ll encounter and that means a red dot will frequently be my preferred optic. Very small targets can be problematic for red dot sights but never underestimate their accuracy potential. For example, I once used a red dot sight to accuracy test a hard-recoiling lever-action rifle. I chose a red dot because I wasn’t certain a magnified optic’s 3½ inches of eye relief was enough to keep the scope from hitting me in the face. Using the red dot, I got sub-MOA, three-shot groups out of that rifle. The secret to shooting small groups with a red dot sight is to adjust the dot intensity to the dimmest possible setting while still being able to see the dot against the target. A bright dot flares and appears much larger than a dim dot. Precision requires a clearly defined aiming point and it is easy to see the clearly circular shape of the red dot when it’s dim. A bright dot will have twice the group size of a dim one. 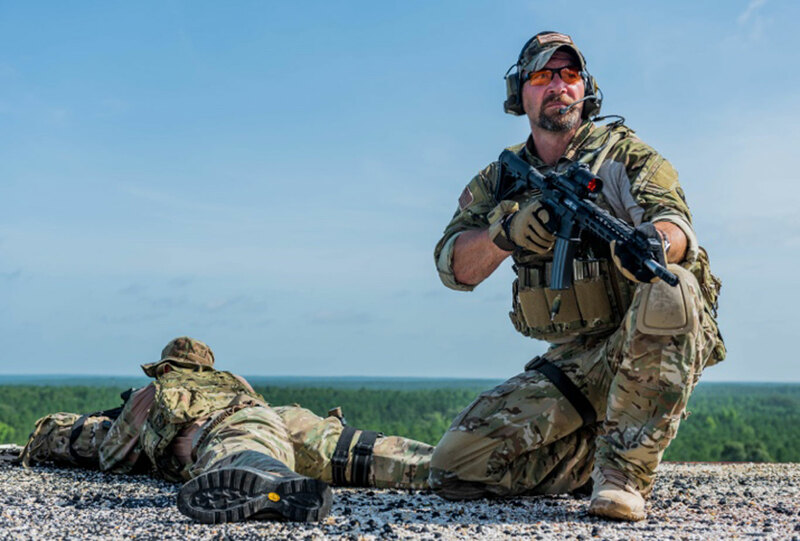 Since many veterans are so familiar with the red dot and its shooting characteristics, it only makes sense to continue their use after leaving the service. 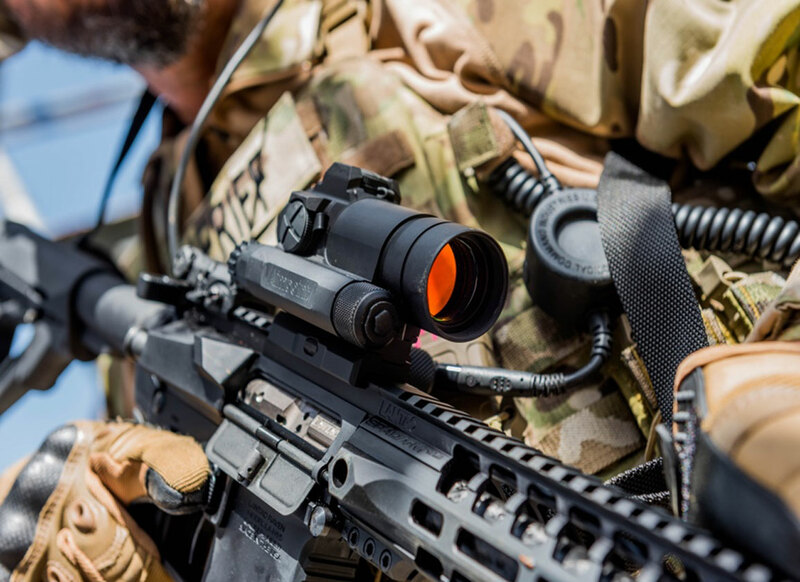 Anything with a picatinny rail scope base is a candidate for a red dot and Aimpoint offers many additional mounting options, allowing use on multiple platforms. 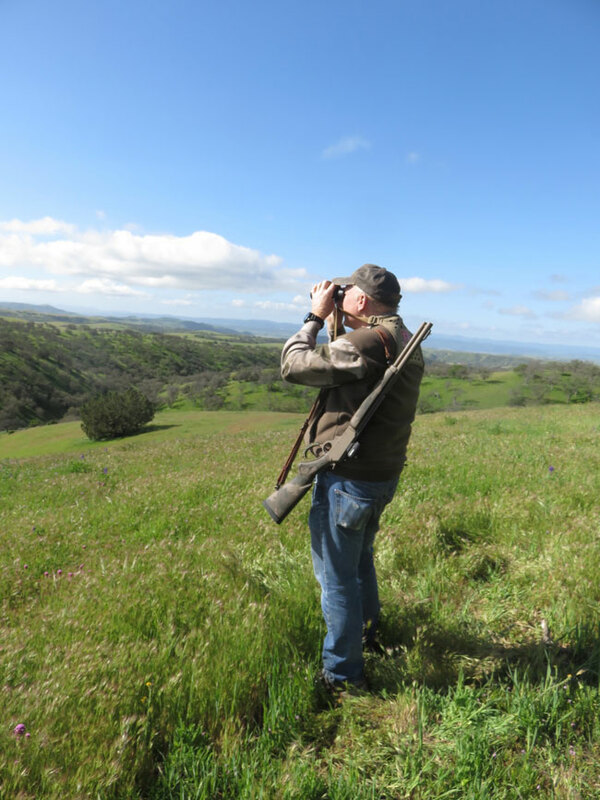 Just as I found in Afghanistan, the ability to aim your rifle without ever taking your eyes off the target is a huge advantage in the deer stand or while chasing hogs. Red dot sights and AR-15s go together like peanut butter and jelly. My personal favorite is Aimpoint’s T-2 with a 2-MOA dot. I also have Aimpoints mounted on two lever-action rifles and think they would be a fine choice on any bolt action used to hunt 200 yards and closer. They are especially useful when hunting dangerous game or in thick brush. 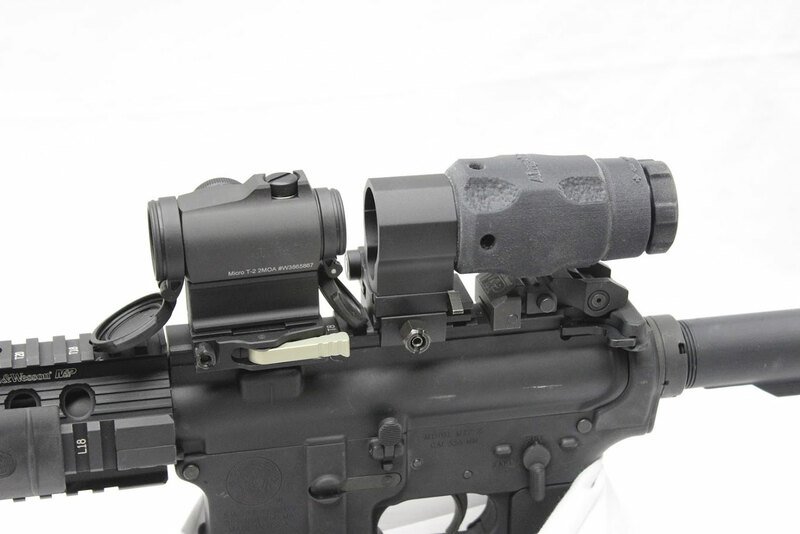 For those times a red dot needs some magnification, Aimpoint also makes a 3X magnifier. The magnifier drops in place via a quick-detach mount. It adds some bulk and weight but it’s a “use-when-necessary” device. The 3X magnifiers bring some parallax error with them. So, I highly recommend spending some time at the range with one prior to stepping off on a hunt. It’s important to know how much you can move your head behind the rifle and how much that shifts the rifle’s point of impact.